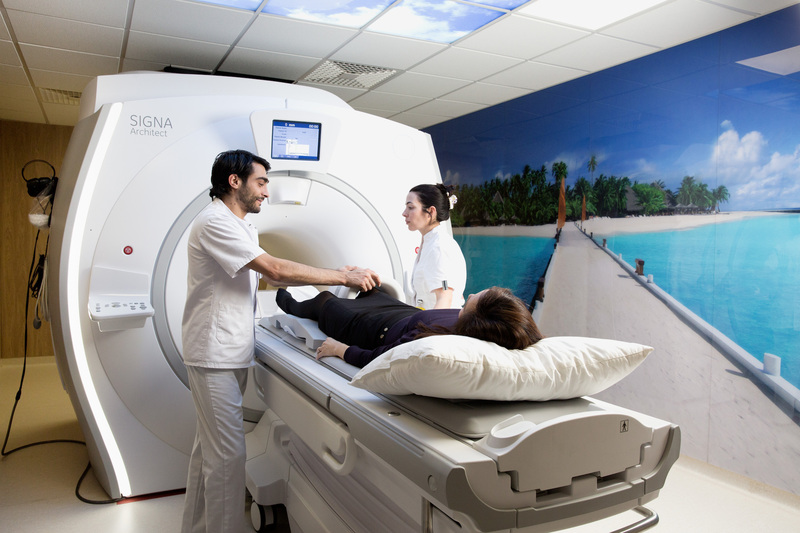 Magnetic resonance imaging (MRI) is a non irradiating type of scan that uses a magnetic field and radio waves to produce detailed images of organs and tissues within the body. 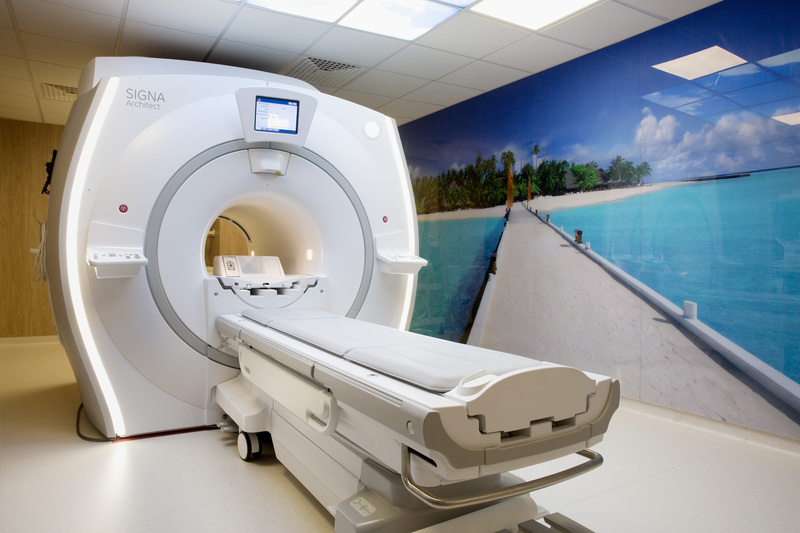 An MRI scanner is composed of a large magnet surounding a sliding table. It can be used to examine any part of the body. During a MRI scan, you lie on a flat comfortable bed that slides into the scanner. Depending on the part of your body being scanned, you will be moved into the scanner either head first or feet first. The region of interest is placed in the center of the machine in order to obtain a better signal. The MRI scanner is operated by a specially trained technician who controls the scanner from behind a window, using a computer. You can talk with the technician through an intercom and he/she will be checking on you on a television monitor throughout the scan. An emergency bell is given to you which you can ring at any time if necessary. At certain times, the scanner will make loud tapping noises, which is perfectly normal. For this reason, you will be given earplugs or headphones to wear. It is very important to keep still during your MRI scan, as any movement is likely to disrupt the quality of the images obtained. The scan will last from 20 to 90 minutes, depending on the area being scanned and how many sequences are programmed. Sometimes, intravenous (IV) contrast agent injection is necessary in order to improve body tissue contrast and to opacify vessels. This contrast medium (Gadolinium) is iodine-free and is rapidly eliminated by the kidneys. Generally, no preparation is required except for abdominal and cholangio-MRI which require fasting during the 4 hours preceding the examination. MR scanning is not always possible for patients bearing certain types of medical implants, such as pacemakers. Patients with heart valves will be asked to communicate the valvular replacement device details. Please inform our reception prior to your appointment (tel : 022 307 13 70) if you have any implanted medical devices. Because of the magnetic field, you will be asked to remove any metal jewelry or accessories that might interfere with the procedure. Please bring your former examinations with you.